The simplest model in the Anita LSI range. Gone are the heavy transistor based models, and integrated circuits are used. At this time Sumlock Anita were using integrated circuits supplied by General Instruments Microelectronics. The four integrated circuits, in metal cans, can be seen from underneath in the photo right (click to enlarge). The design is very sleek and of its time. The display is still nixie tubes (shown left---click to enlarge), but 10 decimal places are available, and it features a 'ring' decimal point. I.e.  the number is rescaled on overflow, though this feature can be overridden if desired. 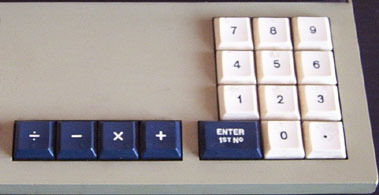 There is no equals key as the calculator uses reverse polish notation. This particular unit is dated 1 Dec 1970. Operating instructions for the Anita 1000 LSI are available on Nigel Tout's website. Switch it on---it works! Last updated 30th September 2017. © 2003-2017 Simon Southwell. All rights reserved.